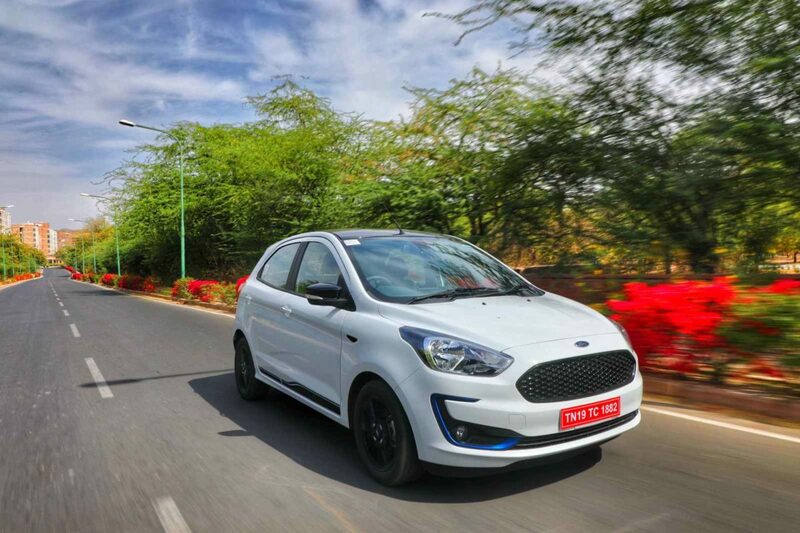 Home News 2019 Ford Figo Review – Best Hatchback Under INR 10 Lakh? 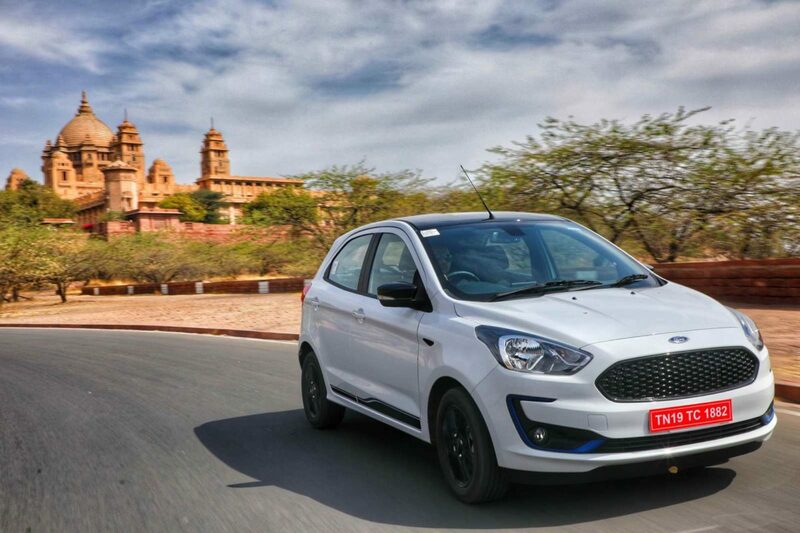 2019 Ford Figo Review – Best Hatchback Under INR 10 Lakh? It is rare for us to attend a media drive, where the car maker’s top man is so confident in the product, he asks us to go out and test the car to its limits and come back with a crazy story. 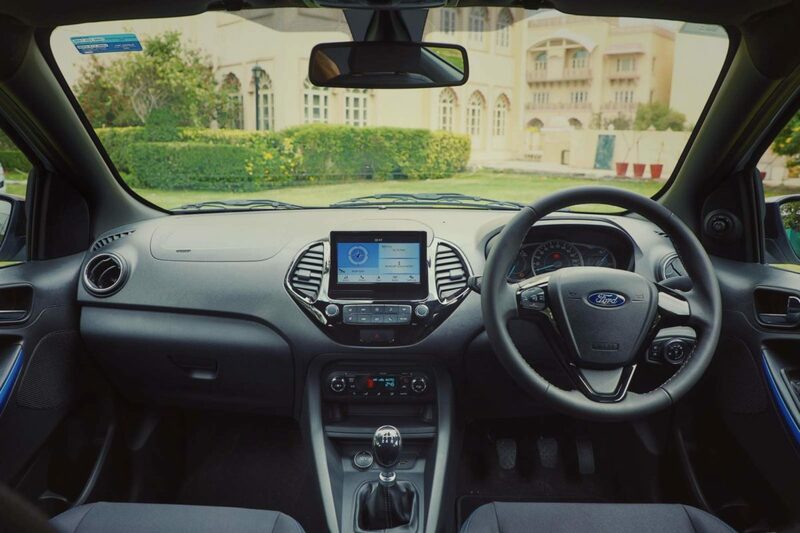 We are an obedient bunch and behind the wheel of the 2019 Ford Figo, we did what was asked. And at the very outset, allow us to tell you that a thrilling experience behind the wheel is a given with the Figo. However, it does not skimp on being practical, economical, inexpensive to maintain or value for money either. Is the 2019 Ford Figo the perfect hatchback then? Allow us to expand our answer. 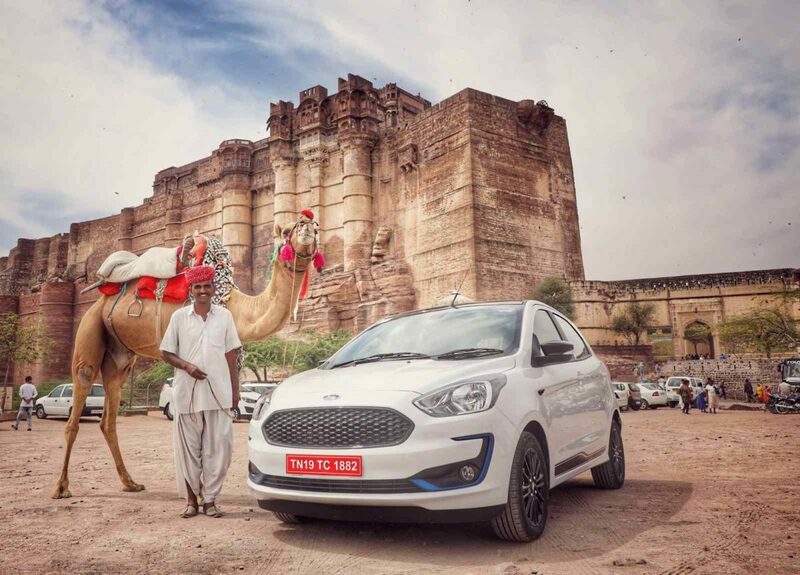 What’s New About The 2019 Ford Figo? In terms of appearance, the Aston-like handsome grille gets a cellular treatment and gets these bead-like inserts. The Titanium version gets a chrome treatment for it, while the top-spec Blu variant gets an all-black unit. The front bumper gets a new angled insert around the fog lamp which is highlighted in blue for the Blu variant and in chrome for the Titanium variant. 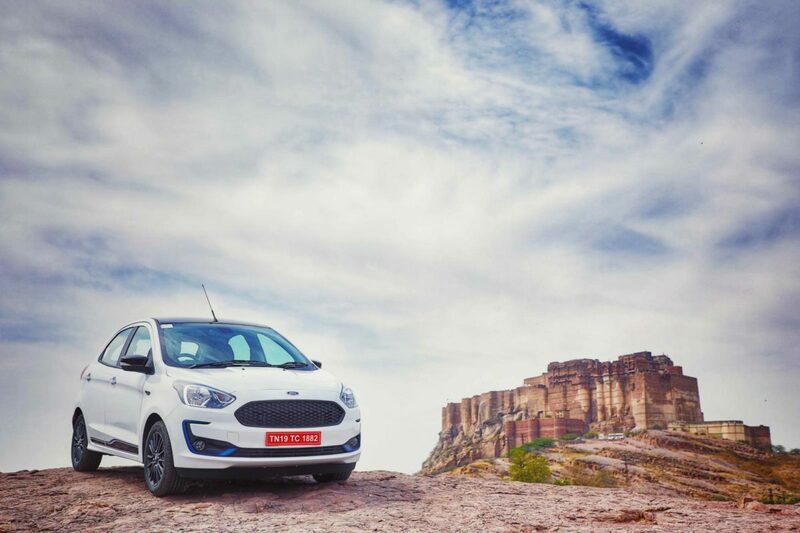 The 2019 Ford Figo is available in 3 trim levels – Ambiente, Titanium and Titanium Blu. Sideways, the Blu variant gets blue and black sticker work along with all-black 15″ alloy wheels, while the Titanium version makes do with 14″ wheels. The ORVMS and the roof get a blacked-out treatment for the Blu variant, while things remain body coloured on the Titanium trim. At the back, the stickering work near the tailgate’s edges makes the top-spec Blu trim stand out. The rear bumper also gets a black insert which makes things look a little interesting. The new Figo also gets a new floating-type display which isn’t compatible with Android Auto or CarPlay but gets in-built navigation and also doubles up as a display for the reversing camera. It is pretty smooth to operate too and the audio quality from the speakers is pretty tight. Besides that, the Blu variant gets all-black fabric upholstery with contrast stitching and Blu lettering on the seats, rain-sensing wipers, auto headlights and an electrochromic IRVM. The new Figo is also equipped with convenience features like push-button start/stop, reverse parking sensors, automatic climate control and front USB slots. While ABS with EBD is standard across trim levels, the top-spec trim gets 6 airbags and the Automatic variant gets ESP. The biggest changes are under the hood, where the 2019 Figo now gets two new petrol motors from the Dragon family. The 1.2-litre 3 potter is good for 96 PS, 120 NM, is rated for 20.4 km/l and is mated to a new 5-speed gearbox. The 1.5-litre petrol motor only comes mated to a 6-speed automatic and is good for 123 PS. Diesel options continue to be driven by the brilliant TDCi motor which cranks out 100 PS, 215 Nm of torque and is rated for 25.5 km/l. Both engines in the New Figo are paired with a sportier five-speed manual transmission that’s almost 15% lighter and helps improve fuel economy while reducing NVH. It also requires 40% lesser gear oil than its predecessor. 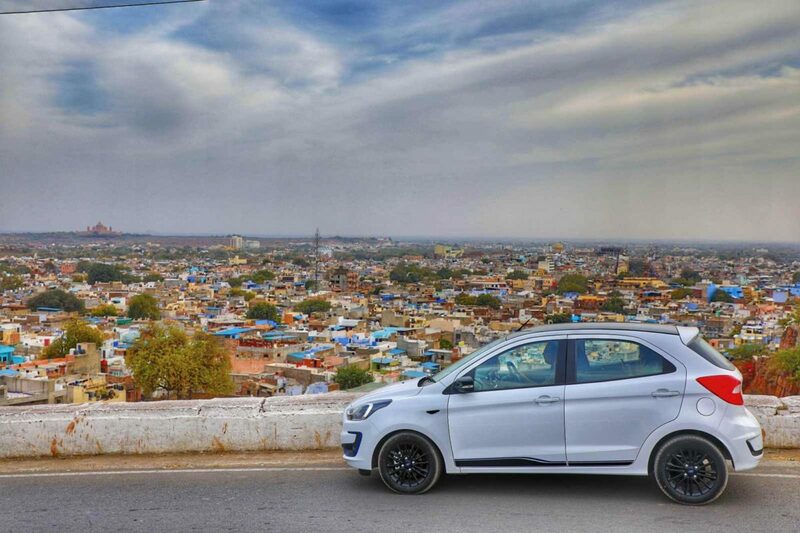 Is the 2019 Ford Figo the best driver’s car under INR 10 lakh? Along with the Tiago JTP, Yes! For the drive, we had the 1.2 petrol and the 1.5 diesel and both engines are rev happy and make the Figo really Swift and peppy. Where the diesel motor feels punchy throughout the rev range, power delivery below the 1,600 rpm mark is great too for within town driving. Post 1,600 rpm, it delivers the goods properly and sounds thrummy when you’re digging the pedal. On the other hand, the Naturally aspirated 1.2-litre petrol engine feels sprightly from the very outset and for being the most powerful in its class on paper, stays true to its credentials even in the real world. But the zip provided by the engines is just half the story. It is how the chassis, suspension and steering are tuned, which make the Figo such a riot to drive. 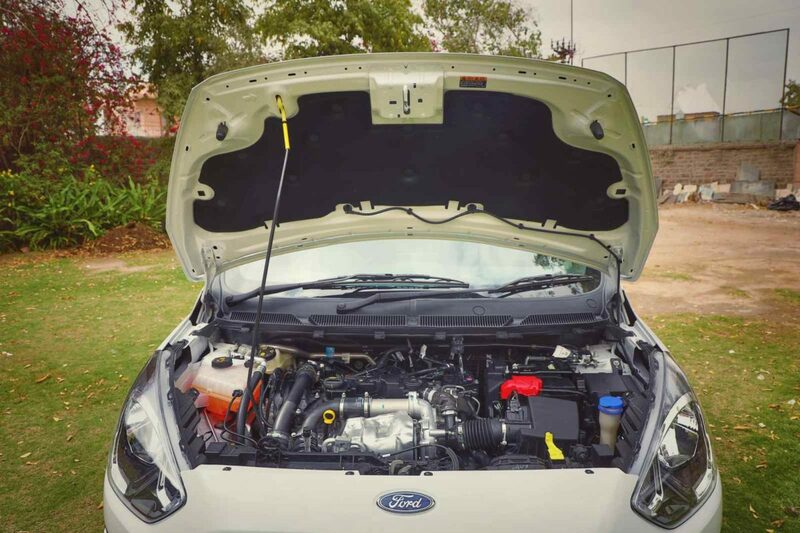 The steering rack is tuned to be sharp and this Ford changes directions like a Bee! The engine’s mass is just not felt when you turn in, which makes the Figo a seriously agile car. Also, the height adjustable seat allows you to sit ‘In’ the car and there’s so much feedback sent to your buttocks, that place feels like it has a nerve attached to the chassis. The effervescence in the Figo’s performance is also due to the fact that the rear axle feels alive and is playful rather than a setup which wants to remain rigid and boring. The electric steering although sharp isn’t very rich in feedback but allows for easy piloting within the city. 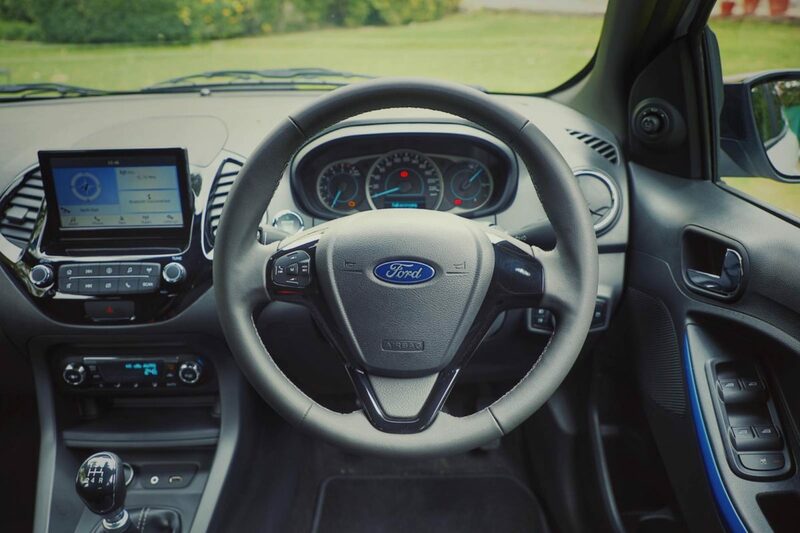 The new gearboxes too, feel a little notchy and a little more crispness would’ve only amplified the great driving experience this Ford has to offer. Brakes are great and the pedal is well tuned for your foot to know how much to push for the right amount of speed to be shed. Ride quality is fantastic and although the chassis is an eager puppy, high-speed composure is brilliant. The suspension is tuned just like the previous-gen Figo’s ‘S’ variant, although the ride height hasn’t been lowered like that car. In effect, cabin comfort isn’t compromised even though driving dynamics are brilliant. It takes only the sharpest of potholes to send a thud through the suspension. At all other times, the cabin is a comfortable place for all occupants. 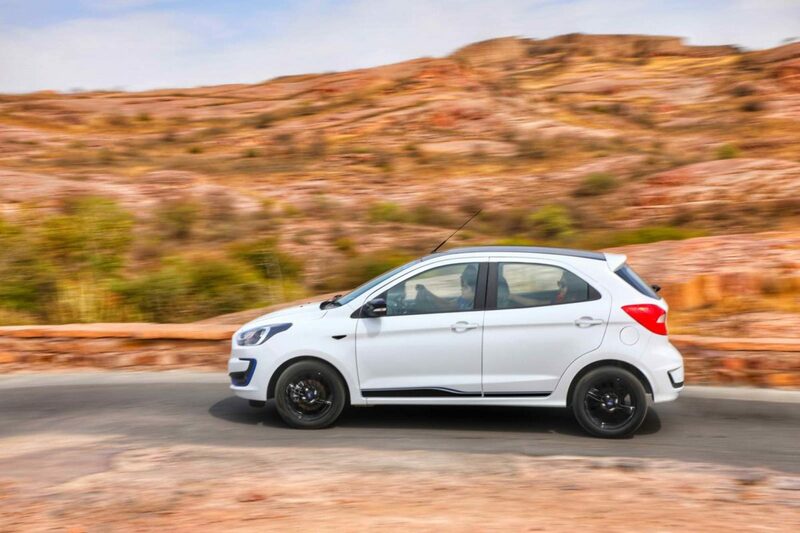 Is the 2019 Ford Figo the best hatchback then? With prices starting at INR 5.15 lakh, going up to 8.46 lakh for the automatic petrol, you’d be ignoring a great overall driving experience if you are buying a new hatchback and aren’t considering the new Figo. It is an involving car to drive, is comfortable for four occupants, gets most of the new-age fancy features, is easy on the pocket to run and maintain, offers a 5-year warranty, as many as 6 airbags, and in our books, is the best looking car in its segment. With three engine choices and the option of a proper automatic, there’s something for everyone too. We rarely are so outspoken about a product. 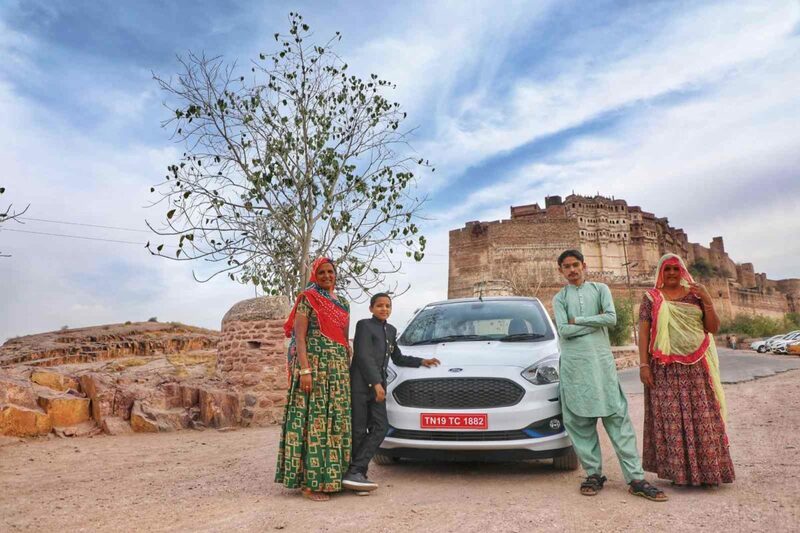 But the new 2019 Ford Figo is definitely the best hatchback you can buy under 10 lakh Indian rupees!